Happy Chairs and More, Outdoor Chairs, Benches and Game Tables Built to Last for Generations. This game table is guaranteed to deliver good times indoor or outdoor! 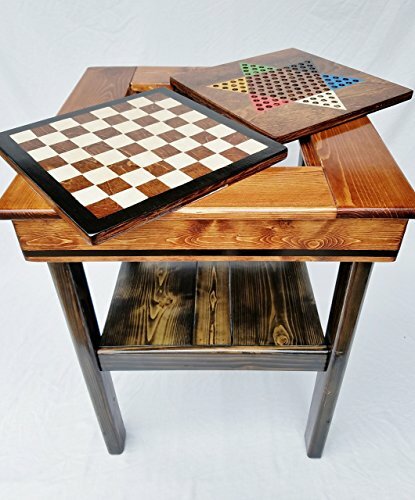 This Happy Game Table is adult size 30"h x 24"w x 24"d.
The table features two reversible game board inserts that measure 14" sq. 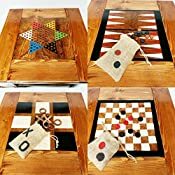 The panels include an engraved and painted Backgammon and Chinese Checkers and painted Checkers and TicTacToe game. Also Included is a set of wooden Backgammon, Checkers and TicTacToe handcrafted playing pieces. The marbles for Chinese Checkers are not included and must be furnished by others. The table also features a shelf and four burlap bags to store the playing pieces. This table is stained in Red Oak on the top and Ebony on the bottom. It is also available in Red Oak, Dark Walnut, Classic Gray or Ebony. Our game tables are hand stained and sealed with two coats of marine varnish to protect your investment and making it easy to clean.